With the recent Mobile changes in Google it has never been more important to have a mobile-optimized website. Since April 21, 2015 Google is penalizing websites that are not “Mobile-Friendly”, which means that if your website does not carry a “Mobile-Friendly” label your website will not be easily found when a customer does a search for your business on their mobile device. Marketing&Mobile´s mobile websites come with many built-in, custom features that we can develop specifically for your business. Marketing&Mobile has the ability to include any type of content on several pages, and we will work with you to provide a stunning mobile website that will effectively promote your brand to a mobile audience. Use your existing logo, header and background. Update your content in real-time. Easy as using Facebook. Guaranteed to work on smartphones and mobile devices anywhere in the world. We track your performance with complete analytics and reporting through Google Analytics. We can build a premium mobile site for you while you keep your existing site and save you money! We will link your mobile site as m.yourdomain.com to yoru desktop site. We make sure your business is ranked in Google when people search on their mobile devices for your business. We will work with you to give you a custom solution which effectively proptes your brand and services. We organize your content in user-friendly menus and sub-menus. We will seamlessly convert the current content of your traditional website to your new mobile website. 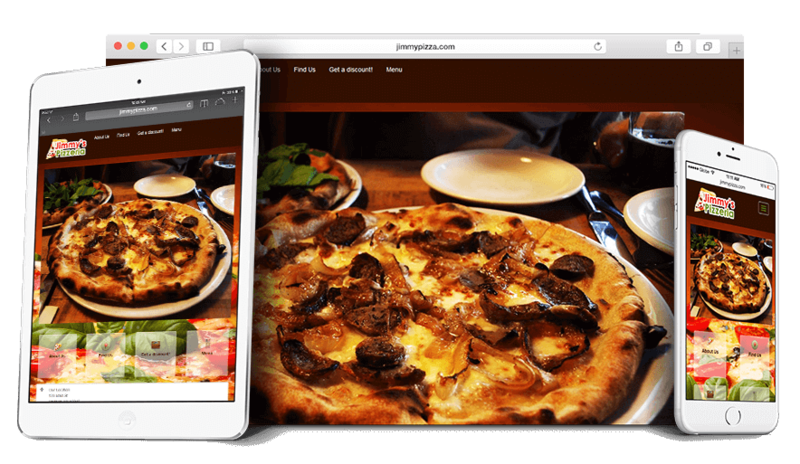 We will create beautiful ‘Mobile -Friendly’ menus that properly display on smaller screens. We will integrate with Opentable to enable your customers to easily book a table using your mobile website. We will enable a calendar to schedule in and share your Special Events with Customers. Keep your customers up-to-date with a mobile-friendly event calendar. Instantly release coupons, daily specials, exclusive offers, customer loyalty rewards and all promotions directly through your mobile site! Upload and share photos of your business successes with customers. For companies with multiple locations we offer a “Find Near Me” GPS radius search, which will connect customers to your closest location. Allow customers to call your business by simply pressing a button. Track all calls made through your site. We will include a user-friendly contact page for your customers to reach out and give valuable feedback. Encourage customers to ‘Like’ your Facebook page and increase fans! Display tweets, schedule retweets and increase Twitter followers! A direct link to Foursquare allows customers to check-in at your location and write instant reviews. Encourage Customers to connect to your LinkedIn business profile for inquiries and opportunities. You and your customers can easily share images of good times at your business with Flickr. Display your YouTube videos to increase engagement and build subscribers. Let the world connect with you! Blogs are a great Communication tool in today’s internet driven society. Share your thoughts on WordPress and get heard! Link to Groupon, LivingSocial, DealFind and all online marketing deals! Marketing&Mobile will provide you with a stunning, premium mobile website that will effectively convert mobile searchers to loyal customers by engaging your customers and instinctively meeting their mobile needs.